#TrendAlert: Bollywood Inspired Bobby Pin Hairstyles You Need To Try! I'm the sort of person who lacks any hairstyling skills whatsoever. My go-to hairstyle would be letting my hair down or just a messy bun. Ever so often, I find myself reaching out to a bobby pin or two to keep some hair out of my face. I couldn't be happier because it seems like our high school hairstyle is about to make a comeback. 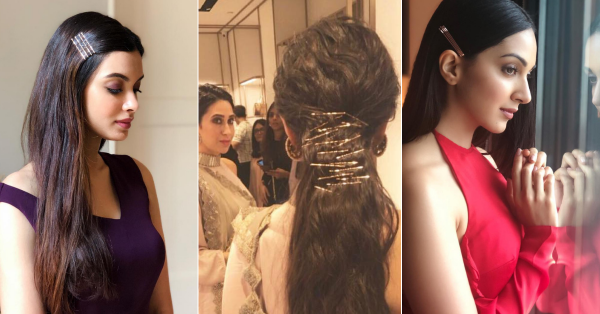 All your favourite celebrities are currently rocking bobby pin hairdo. If a hairstyle gets its seal of approval from Bollywood, you know it's legit. So what are you waiting for? Lazy girls, go buy some bobby pins and get creative with these hairstyles. The best part? There are no rules! Let your creative juices flow. Karisma Kapoor rocking the bobby pin hairstyle even with an Indian outfit. Who'd have thought right? Diana Penty added a few bobby pins to dress up a classic open hairdo, and I love it! Kiara Advani's sleek and straight hairdo looks ever so pretty with that subtle bobby pin addition. Can you see how easy it is to use bobby pins to create these gorgeous hairstyles? And they require almost next to zero skill! Here's a tutorial recreating Alia Bhatt's sleek and stylish bobby pin hairdo! Looking for more bobby pin inspired hairstyles? Keep scrolling!